Is it mature right now? What are Service Providers doing in SD-WAN domain? What about the MPLS vs. SD-WAN discussion in Service Providersbusiness? In this post, I will share my insights for these three important questions. 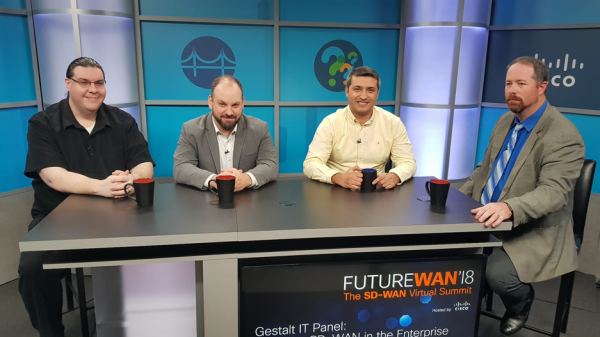 Tom, Jed, Ethan and I joined the Gestalt IT’s roundtable discussion and talked about many topics about SD-WAN deployment in the Service Provider networks. I had a great time and thanks to Cisco Viptela and Gestalt IT for selecting a very important topic as it shapes many Enterprise Wide Area Networks as well as Service Providers most important business customer service which is MPLS. The main concepts during the discussion were SD-WAN maturity, Traffic Engineering in the Service Provider networks, co-existence with SD-WAN and MPLS and last but not least the comparison between MPLS vs. SD-WAN. Many Enterprises have been deploying SD-WAN and migrating their legacy traditional WAN routers to SD-WAN boxes. But some vendors such as Cisco migrate traditional WAN to SD-WAN with only upgrading the software instead of the need to replace routers. SD-WAN provides the ability to have multiple Internet links to prioritize the best performing ones for the critical applications and use the ones with less performance with the elastic applications such as data traffic. Enterprises are moving from the MPLS circuits to Internet based circuits, having direct Internet access from their branch offices and connecting their Branch, Datacenter and Headquarters over Internet by creating an Overlay VPN over Internet. Service Providers started to realize that fewer customers are buying their MPLS service. Many of the Service Providers which I am aware of finished their SD-WAN proof-of-concept (POC) and among the many SD-WAN vendors, they selected the best suitable vendor for their purposes. I provide consultancy services for many Service Providers and they are telling me that they think SD-WAN is a mature technology. They are selling SD-WAN managed service to their Enterprise customers. Some other Service Providers that I speak with still think that they should wait and see large scale deployments while at the same time they are doing POC with many vendors actively. During the FutureWAN session we discussed that Service Providers can provide value-added services to Enterprise customers who are looking to deploy SD-WAN. For many years, Service Providers have been doing Traffic Engineering in their network with RSVP – Resource Reservation Protocol. Recently I started to see many Segment Routing deployments in the Service Provider networks. SD-WAN as an Overlay VPN is carried over Service Provider network. When Service Providers start selling managed SD-WAN, it is important to provide SLA over their underlay network. Most of the Service Providers infrastructure are based on MPLS. SD-WAN will not change the Service Provider infrastructure CORE/Backbone network. Replacing MPLS with Internet by the customer, only changes the service offering from the Service Provider, not their internal network. This is a very important distinction that network engineers should understand. How can Service Providers provide SLAs for the critical applications of SD-WAN customers? They can continue to do this with the RSVP-TE in their underlay internal network, and also there are recent works in IETF on Segment Routing with SD-WAN coexistence. https://tools.ietf.org/html/draft-dunbar-sr-sdwan-over-hybrid-networks-02 explains how SD-WAN service can be differentiated on the underlay network by using Segment Routing. We discussed this briefly during the FutureWAN session. The idea is that SD-WAN controller signals the segment routing (SR) Controller asking the low latency path and in turn the SR Controller signals the SID-list to the headend/ingress Service Provider Edge device. Also, the SR controller informs the SD-WAN controller to signal SID list to the SD-WAN edge boxes. By coordinating between SD-WAN edge <–> SD-WAN Controller <–> SR Controller and network ingress nodes, end to end differentiated service can be provided by the Service Provider to their customers. Service Providers can get benefits by providing Managed SD-WAN services controlling CPE devices of the customers, controlling SD-WAN Controllers and having traffic engineering in their network with Segment Routing or with RSVP-TE. They can provide SLA guarantee to customer’s real time applications by assigning low latency path to Voice and Video traffic, and assigning high bandwidth path for the data traffic. In summary, SD-WAN is a mature technology for Service Providers. MPLS service sales is declining and more Enterprise and SMB is looking for more cost-effective options such as Internet, thus they see SD-WAN as a good technology and last but not least Service Providers are looking for more use cases such as Managed SD-WAN deployments. I don’t see SD-WAN as an enemy for the Service Providers, though it reduces their MPLS service offering, but I see SD-WAN as a business enabler for them since it gives an opportunity to the Service Providers to provide low latency path to the mission critical applications of their customers, not the best effort path, in an automated and orchestrated way.